Just over four weeks after the Philadelphia Eagles beat the New England Patriots in Super Bowl LII, 13 brands associated with the big game still seem to be benefiting, according to YouGov BrandIndex. While many of this year’s Super Bowl advertisers saw immediate gains among consumers following the event, some appear to be reaping long-term advantages from the exposure, as well. Since the game, WeatherTech, a vehicle accessories company, has seen the largest rise in their Buzz score, which measures whether respondents have heard anything positive or negative about the brand in the past two weeks. Other brands that have seen a significant increases in Buzz are the NFL, Budweiser, Pepsi, and Mountain Dew. 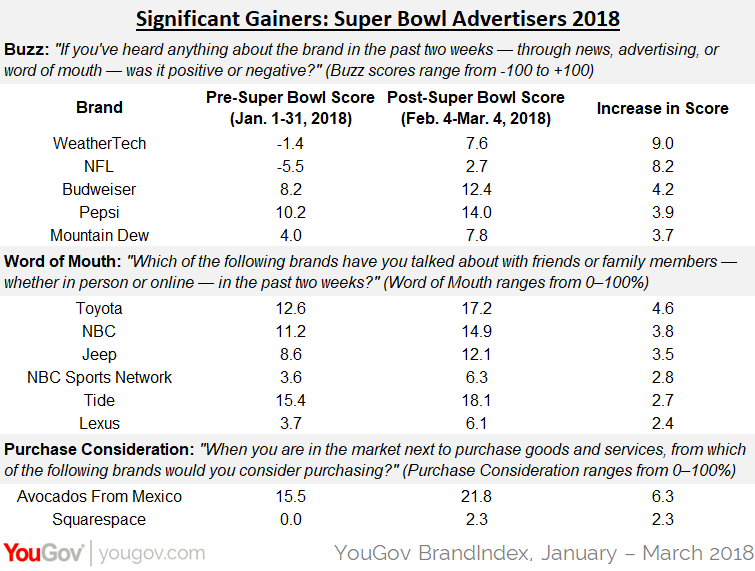 When it comes to Word of Mouth, Toyota tops the list, likely benefitting from the one-two punch of Super Bowl advertising and Olympics sponsorship. Word of Mouth measures whether respondents have talked about a brand with friends or family in the past two weeks. Other brands to score larger gains in Word of Mouth include both NBC and NBC Sports Network, which also aired the Winter Olympics, as well as Jeep, Tide, and Lexus. Two brands — Avocados From Mexico and Squarespace — saw significant gains in their Purchase Consideration score, YouGov BrandIndex’s measurement of potential sales revenue. Avocados From Mexico also placed in the top 10 gainers for both Buzz and Word of Mouth. Squarespace, meanwhile, placed in the top 10 gainers for Buzz.